The opening round of the KCB Kenya National Autocross championship came to a dramatic end at Cheita Farm over the weekend with second generation drivers dictating the pace in their respective classes. Outgoing three times Bambino champion Ryan Bailey was in a class of his own in his new class and buggy when he restricted reigning junior champion Rajveer Thethy to second place. Rajveer, son of former Two Wheel Drive champion Charan Thethy, drove a Daewoo machine which has over the past few years been synonymous with the Thethy family. Ryan, one of the best all round youngsters and son of the legendary Paul Bailey won the Two Wheel Drive Junior Non Turbo class serving up great moments ahead with a fastest heat time that saw him vanquish all the "Attacker Buggies" contrary to all expectations. It was double celebration for the Bailey family with Ryan's mum Gillian crowning her autocross debut with victory in the Two Wheel Non Turbo class. "Yesterday (Sunday) was definitely my best day of racing ever," quipped Ryan, adding: "I completed my first race in the junior class and finished first. I also narrowly set the fastest time of the day beating all the buggies on times. It was a great event." Notable absentee in the junior class were Don Smith siblings- Rio and Sean - who are expected to unveil their new Vitz 1500cc machine soon. 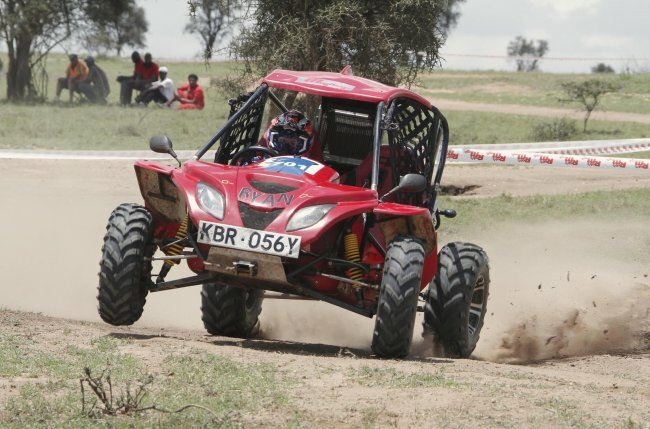 Syanna Jessop, daughter of multiple Safari Rally navigator champion Tim Jessop, entered her name in the annals of autocross championship history by being the first girl to win the bambino class. "The 2.2km track was awesome and suited my driving style. I did my best to improve on my times in each lap. I feel more comfortable with the bambino buggy and hope to improve on my lines and keep speed through corners," 15 year old Syanna, who is a student at Hillcrest School, said. Imran Hakada emerged the victor in Two Wheel Drive Non Turbo class ahead of Shalien Mughal, Karan Sehmi and Lovejyot Singh. "This year will be more fun and competitive as there are many drivers practicing to make themselves better. It will be competitive, interesting and fun," Hakada said. Defending Four Wheel drive turbo champion Azar Anwar proved that age is nothing but a number. Anwar 63, won his class with the fatest overall heat of the day by bearing the younger generation of drivers to a breathtaking podium dash. Anwar posted the fastest overall time on the best of three heat total. Gillian savored her debut in Two Wheel Drive Non Turbo class which saw her defeat Tejas Hirani who drove a bambino buggy and couldn't match Gillian's time in a slower machine. Lovejyot Singh had this to say after returning from sabbatical: "The race was all good and well organised. The track was very fast with nice flowing corners back to back and I was overly glad to tackle my first NRG event. I finished 4th in my class and felt a bit rusty driving again after a 6 months of break." Nikhil Kapoor was all smiles and this is what he had to say: "Its was an amazing track. Very well organized. As for me, the buggy developed some issues on the practice heat but with the consent of the officials, I was allowed to share a buggy with Shaz Esmail." Other second generation drivers included McRae Kimathi , son of KSMF chairman Phineas Kimathi and Ken Nteere, son of the late Washington Nteere.